BANFF, ALBERTA, Canada – Any experienced backcountry skier knows the sheer adrenaline rush that comes with this exciting winter sport. There’s no better place to learn the fundamentals of backcountry skiing than in Banff National Park, a top backcountry ski destination in the Canadian Rockies. Our Banff backcountry ski course teaches you the basics of backcountry skiing so you can get out of the lift lines and into the wild. With our certified ski guides you’ll learn important techniques such as how to travel on ‘skins’ and use other gear necessary for skiing the Canadian Rockies. Our Banff backcountry skiing weekend course introduces you to one of the fastest growing winter activities in the world. Ski untracked backcountry powder and experience the tranquility of alpine ski touring with some of the best guides in the industry. Let our experienced instructors show you the best backcountry skiing in Banff, Canmore, Kananaskis and Lake Louise. We guarantee you’ll love backcountry skiing in the Canadian Rockies, where you’ll find ‘fresh tracks’ on nearly every run. Enter the backcountry and kiss those lift lines goodbye! Any experienced ‘out of bounds’ backcountry skier or ice climber knows that avalanches are no joke. As the leading recreational Avalanche Course provider in the Canadian Rockies, Yamnuska Mountain Adventures takes avalanche safety very seriously. Our Banff avalanche safety courses are held throughout the winter and teach you the necessary safety skills you need to enjoy the backcountry. Yamnuska’s full time guides are equipped with the knowledge and experience to help you improve your safety margins and accurately assess risk. All guides are certified through the Canadian Avalanche Association. Yamnuska Mountain Adventures provides top notch training for those looking to experience backcountry skiing in Banff, Alberta. 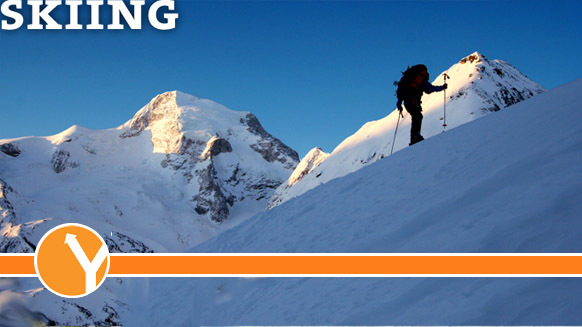 We also provide the best instruction for ice climbing, rock climbing, trekking and mountaineering in Banff. Our outstanding training courses and tours are available at all skill levels. Get ready to hit the slopes by watching this awesome Yamnuska Mountain Adventures video! Backcountry skiing is an adrenaline-filled activity that allows you to experience the outdoors in its raw form. However, this extreme sport is not without its share of risks, the biggest of which is avalanche. When backcountry skiing in Banff, always take the necessary precautions and be aware of your surroundings. This is the best way to experience Canadian Rockies backcountry skiing, whether you’re a beginner or a seasoned expert.